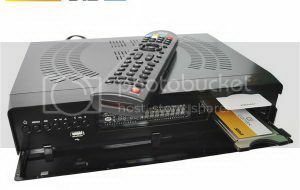 Galaxy Innovations GI Matrix 2 HD Receiver Two tuners, Combined satellite and digital terrestrial receiver with support for the new format of DVB-T2. So the receiver GI Matrix 2 two tuners – DVB-S2 and DVB-T2, an option you can change any of them for a cable tuner DVB-C. The receiver comes with a universal card reader and CI slot for CAM modules. Besides that, the receiver has 2 x USB port for recording channels, TimeShift mode and update the software. Matrix 2 has the ability to connect external Wi-Fi adapters to work with the Internet, which is a good alternative to the standard Ethernet port. The big advantage of the device is the presence of the modulator and RF-output 0/12 volt, what so many HD receiver.